My question is: “Where, in blue blazes, was all this conservative muscle the last 6, 4, even 2 years? Evidently someone in the Freedom Caucus finally figured out how to play hard ball. Don’t get me wrong. I’m thrilled at the recent event in congress. It must have taken a lot of “something” to get Boehner to resign, and to get the heir apparent, McCarthy, to step away from the power position. And with the establishment push to put Paul Ryan in the spot is now being met with more conservative push back. Why? He’s not conservative, enough. The New York Times reports: . . . In 2012 when Mitt Romney picked Mr. Ryan, Republican of Wisconsin, as his running mate, the concern among some in their party was that Mr. Ryan was too conservative, particularly when it came to overhauling social programs like Medicare and Medicaid. Now, as he agonizes over whether to answer the appeal of his colleagues to become their next speaker, the far right is trotting out a fresh concern: Mr. Ryan is too far left. He is being criticized on issues ranging from a 2008 vote to bail out large banks to his longstanding interest in immigration reform tohis work on a bipartisan budget measure. On Sunday night, the Drudge Report — a prime driver of conservative commentary — dedicated separate headlines to bashing Mr. Ryan on policy positions. Even a self-congratulatory book outlining how Mr. Ryan and two other Republican House leaders drafted Tea Party candidates to help them take over the House in 2010 — “Young Guns” — is being recast by some as a manual of how to be traitorous to conservatism. The influence of conservative websites has enraged members who were once considered right of center themselves, and who are desperately trying to keep Mr. Ryan from getting spooked. To some degree, the attacks on Mr. Ryan, so far an unwilling draft pick by his colleagues to replace Speaker John A. Boehner, reflect criticism of flashes of pragmatism by Mr. Ryan, the architect of his party’s conservative budget dogma. Since the 2012 general election defeat, Mr. Ryan has indeed become more of a consensus builder and leader in the House, even as he has maintained his ideological tilt. He has largely voted for bills to keep the government operating and the debts paid when many other Republicans vote against them these days. He was half the brain on a 2013 compromise with Senator Patty Murray, Democrat of Washington, to funnel more money to the government and avert two years of budget brinkmanship, even though two years earlier, he had refused to sit on the original committee that tried and failed to find a solution to the government’s financial problems. Mr. Ryan moved this year to the chairmanship of the tax-writing Ways and Means Committee from the Budget Committee because he said he wanted even greater influence on national fiscal policy, and his prescriptions are anathema to most Democrats. But the current flak following Mr. Ryan stems from a growing and powerful collection of far-right pundits and news media — from Mark Levin to Laura Ingraham to the sites RedState and Breitbart and the new Conservative Review — that have successfully wielded influence over Republican voters and lawmakers in strongly conservative districts. Their bill of particulars against Mr. Ryan have shifted from the national debt and spending to immigration. Lately, they have focused on Mr. Ryan’s enthusiastic support for free trade, traditionally a policy that has gotten broad Republican support but is now being used as a bat against him. Beyond Mr. Ryan, the conservative targets have seemingly shifted from old time establishment lawmakers to a process seemingly more akin to random selection. On Monday, a Tea Party group in Alabama set out warning flares to Representative Martha Roby, a Republican, advising her that she would come under fire if she supported Mr. Ryan for speaker. But House Republicans and their staff say millions of Republican primary voters have their opinions shaped by sites like Breitbart.com, which define a version of the conservative position of the moment, then whip their readers into a frenzy, imploring them to oppose anyone who takes a different position. 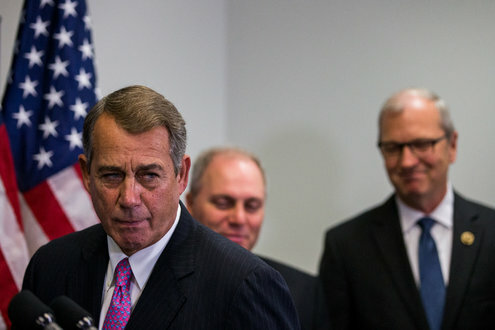 Mr. Boehner, for instance, once considered unquestionably conservative, was forced out by his right flank. His would-be successor, Representative Kevin McCarthy of California, the majority leader, abruptly withdrew from the speaker’s race, also the target of Internet rancor that he was too much like Mr. Boehner. The conservative rap on Mr. Ryan’s fiscal positions is especially curious. As Budget Committee chairman, Mr. Ryan was the author of plans that would convert Medicare into something akin to a voucher plan, where seniors would get government subsidies to purchase private insurance and move away from government-run health care. He also wanted to turn Medicaid into increasingly tight block grants to state governments, and he also called for drastic cuts in food stamps, Pell grants and many other domestic programs. But in 2013, Mr. Ryan and Ms. Murray reached an agreement, which passed 332 to 94 in the House, that modestly raised spending restrictions on military and domestic programs for two years, bringing temporary peace to the incessant budget wars that are now eliciting the wrath of the conservative industrial complex. Immigration is proving to be an even more ripe area for venomous assessment of Mr. Ryan. He pressed for a vote on an immigration reform bill with his Republican colleagues in 2013, noting that “earned legalization is an issue I think the House can and will deal with” but was rebuffed. While 53 percent of Republicans support some earned path to citizenship for immigrants living in the country illegally, said Robert P. Jones, the chief executive of the Public Religion Research Institute, citing a 2013 poll, “support drops well below majority to 45 percent among Republicans who identify with the Tea Party,” he said. The question for Mr. Ryan, now ensconced in Wisconsin with his family while Congress is in recess, is whether the heat from the right is worth the fight or whether he will gamble that he can overrun them and win far in excess of the 218 votes needed to elected speaker in spite of all that noise, and start off strong and ready for the next round. Now that they have found their sea legs, my money is on the Conservative Mafia to continue to influence legislative leadership direction. All I can say is, it’s about time.